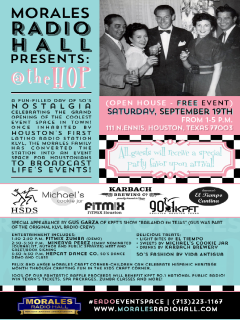 Morales Radio Hall presents @theHOP, a fun-filled day of '50s nostalgia celebrating the grand opening of the coolest event space in town. Once inhabited by Houston's first Latino radio station KLVL, the Morales family has converted the station into an event space for Houstonians to broadcast life's events. The event will include a raffle to raise money for KPFT's "Bailando en Tejas" show.